The UFC returns for its next pay-per-view offering with UFC 228 from the American Airlines Center in Dallas. The main event features Tyron Woodley defending the welterweight title against Darren Till. The co-main event was scheduled to be Nicco Montano putting the women’s flyweight title on the line against Valentina Shevchenko, but on Friday morning, Montano was hospitalized due to kidney issues. The fight was canceled, and Montano was stripped of her championship. Since knocking out Robbie Lawler at UFC 201 to win the title, Woodley (18-3-1) has made three consecutive defenses. He has defeated Stephen Thompson twice and, most recently, Demian Maia at UFC 214. After the Maia bout, Woodley had surgery to repair a torn labrum. Overall, Woodley will go into UFC 228 unbeaten in his past six fights. Till (17-0-1) made MMA fans take notice when he scored a first-round TKO victory over Donald Cerrone at UFC Gdansk in October. The 25-year-old solidified a title shot by defeating Thompson via a unanimous decision at UFC Liverpool in May. Till missed weight by three pounds the day before the fight. Is this the night Woodley’s reign ends and a new era begins in the welterweight division? Follow Sporting News throughout day as we provide updates leading to the 6:15 p.m. ET bell time. 8:25 p.m.: Next at UFC 228, Geoff Neal faces Frank Camacho in welterweight action. Neal is on a nice run, winning his last three fights, all of them by stoppage. Camacho’s lost two of of his last three bouts. Weird the UFC would book a matchup like this. They tend to shy away from pairing fighters up who are on different sides of the spectrum. 8:17 p.m.: Darren Stewart def. Charles Byrd by second round TKO at 2:17 of the second round. People always say a fight can change with one shot. That proved to be true as Byrd controlled the entire first round in which he was battering Stewart on the feet. Then in the second round, Byrd had his back against the cage and Stewart clipped Byrd with a sharp, standing right elbow to send Byrd to the canvas. A couple punches later and it was all over. Great comeback victory for Stewart. A loss would have netted him a pink slip and now he’s got life. 8:06 p.m.: Right now at UFC 228, Charles Byrd fights Darren Stewart in middleweight action. Byrd is on a roll, having won four consecutive fights, all via stoppage. Stewart has lost three of his last four, but won his last outing against Eric Spicely in February by second round TKO. Two of the best nicknames on UFC 228: “Kid Dynamite” versus “The Dentist”. 7:59 p.m.: Diego Sanchez def. Craig White by unanimous decision (30-27, 30-27, 30-27). Head scratcher on how this wasn’t scored 30-25 for Sanchez. He dominated every second of the first and second round. The best performance from Sanchez in five years. He still fought aggressive, but implemented his ground attack and didn’t White no room to breath. For one night, Sanchez proved he still has something left. How much? Who knows, but at least for one more night, we got to see “The Nightmare”. 7:50 p.m: Could we have two 10-8 rounds scored for Sanchez? 7:44 p.m.: What a first round for Sanchez. The best round in the last few years for Sanchez. Came out very aggressive with an early takedown and battered White on the ground for the entire five minutes. Can Sanchez continue this pace for another 10 minutes? 7:27 p.m.: Jim Miller def. Alex White via submission (rear-naked choke) at 1:29 of the first round. One of the most spectacular wins in Miller’s UFC career. All started when Miller clipped White with a left hand to send him back against the cage. Sensing he had White in trouble, Miller landed a couple more shots to get White to the mat. He quickly took White’s back, locked in the choke and moments later, White tapped out. Miller snaps a four-fight losing and earns his 17th win in the lightweight division. the most in UFC history. 7:20 p.m.: Coming up at UFC 228, a lightweight battle between Jim Miller and Alex White. Miller is fighting in a record-setting 30th time in the UFC. But he is dire need of a win, as he’s lost four consecutive bouts. White could also use a victory, as he’s lost two of his last three. Who will get the much needed win? 7:14 p.m.: Irene Aldana def. Lucie Pudilova by split decision (28-29, 29-28, 29-28). A shame you couldn’t the victory to Aldana and Pudilova. One of the more exciting women’s fights in 2018. They stood toe-to-toe for 15 minutes and threw strike after strike with neither taking a step back. By the end, Aldana and Pudilova were bleeding and exhausted. Fans want to see fighters giving it their all and leaving everything they have inside the Octagon. Well done. Aldana’s now won back-to-back fights after losing two fights in a row. 7:06 p.m.: Don’t know how Aldana and Pudilova are standing here. We are seeing high level striking at its finest and they are stalking each other and throwing it all out there. 6:59 p.m.: Highly entertaining first round. Aldana and Pudilova dishing out the heavy artillery. They have very good chins as Aldana and Pudilova walked through those series of shots. Should be in for an entertaining fight. 6:53 p.m.: Next at UFC 228, a women’s bantamweight fight between No. 12-ranked Irene Aldana and No. 13-ranked Lucie Pudilova. Aldana has seven finishes in the first round with four of them coming in under 1:05. Since losing her UFC debut, Pudilova’s reeled off back-to-back wins. Exciting fight featuring two women looking to create some noise at 135 pounds. 6:45 p.m.: Jarred Brooks def. Roberto Sanchez via split decision (28-29, 29-28, 29-28). Let the crazy scorecards begin. Very difficult to see how Sanchez won two rounds. He won the first, gave away the second and Brooks dominated the third. Really impressed with Brooks’ performance. Did a fantastic job in knowing if he was going to win and have enough cardio in the tank since he accepted the fight on five days notice, he would need to utilize his wrestling. Brooks did just that and had enough energy in which he could have gone five rounds if necessary. 6:36 p.m.: Surprised Brooks has anything left in the gas tank and the second round is just about to end. Hard to understand why Sanchez pulled guard. No reason to do that whatsoever. He just gave a round he was winning. 6:25 p.m.: Our opening bout at UFC 228: Jarred Brooks takes on Roberto Sanchez in flyweight action. Brooks got added to the card on Monday after Ryan Benoit had to bow out of the fight. He looks to rebound after suffering back-to-back losses. After losing in his UFC debut, Sanchez rebounded with a first round submission victory of Joby Sanchez at UFC Fight Night 126. Give Brooks credit for taking a bout on extremely short notice. Nothing to lose in this situation, as he can just go in and go all out and even if he loses, he comes out smelling like roses because he accepted the fight on short notice. 6:10 p.m.: We are moments away from he beginning of UFC 228. Grab your refreshments and stay locked into SN’s coverage all night long. 1:40 p.m.: Tyron Woodley and Darren Till square off one final time before they meet inside the Octagon. — Who will emerge victorious at UFC 228? SN’s MMA experts give their picks. — Nicco Montano off UFC 228 card after being sent to the hospital. — Interested in making some money on UFC 228? We give you the best plays heading into the show. 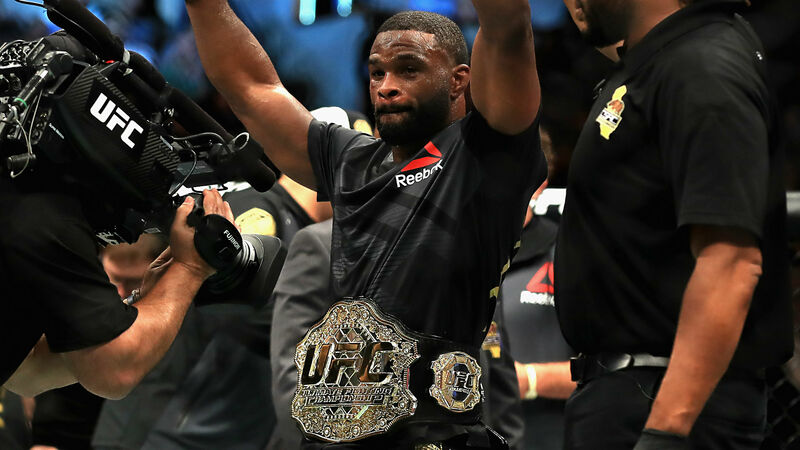 — Why doesn’t Tyron Woodley get the proper respect as welterweight champion? He offers an explanation to SN. — Who is Tatiana Suarez? SN takes a look at one of the rising stars in the UFC. — Is Valentina Shevchenko the women’s fighter to supplant Ronda Rousey as the next female star? — Darren Till explains to SN why he would rather become great than making millions of dollars. — Shevchenko tells SN that she wished the women’s flyweight division would’ve came along much faster than it did.